The SnuggleSafe Heatpad contains a gel called Thermapol which is non-toxic and able to sustain warmth when heated in a microwave. Thermapol is able to give off warmth that can last up to 10 hours when placed in cover or under the pet's blanket. Each SnuggleSafe Heatpad is 8" / 210mm diameter and weighs 0.9kg. Which pet is SnuggleSafe most suited for? It is ideal for newborn animals (puppies/ kittens), animals on the move, animals kept outside (rabbits/ guinea pigs) in hutches, kennels/catteries and perfect for convalescing animals. SnuggleSafe is bite resistant, has no wires for a pet to chew through and is fully washable. All heatpads now come with a cosy cover for extra comfort. Why is the shell not made of rubber like a hot water bottle? The shell is made of polypropylene. A durable, hygienic, bite resistant & non-expanding safe material. SnuggleSafe is much safer for pets than an "old fashioned" rubber hot water bottle, or granary wheat bag. 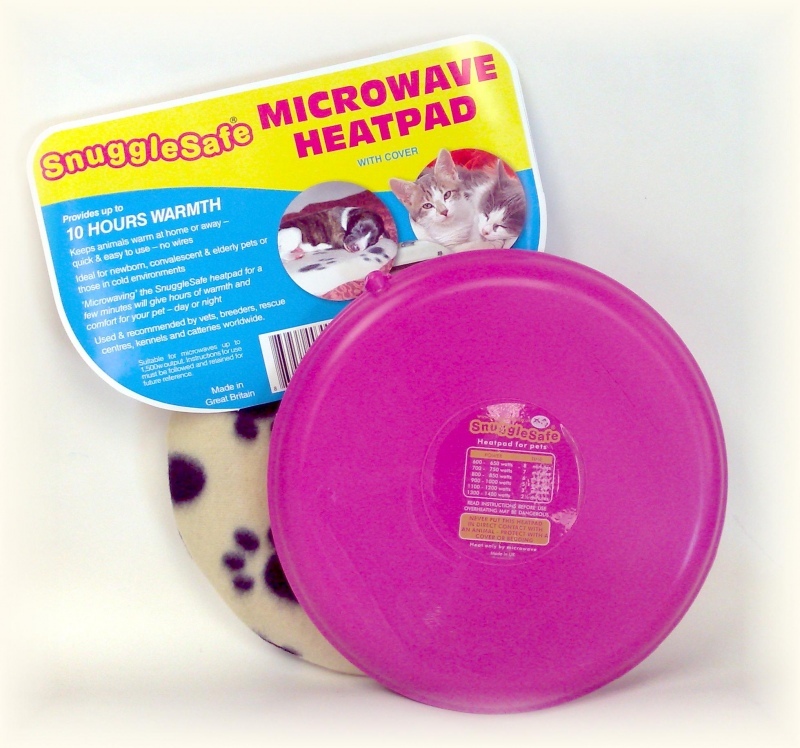 How many times can you use the SnuggleSafe Heat Pad? The Heat Pad can be reheated from cold as many times as required. If used daily we recommend changing it every three years. Never reheat from warm or over heat. SnuggleSafe is SGS tested for pet safety- SGS is a respected testing house that ensure products performs to their design and purpose. Can you harm an animal with a Heat Pad? It is designed to give steady warmth over 10 hours. A constant 45- 56 degrees C over 5-6 hours then slowly declines for the remaining 4 hours. We recommend you always have a barrier e.g. cosy cover or blanket, between the animal and the SnuggleSafe Heat Pad. Below are some recent questions we've received regarding Snugglesafe Microwavable Heat Pad & Cover, including answers from our team. Is the cover provided sufficient cover for the heatpad to be used as is? Yes the heat pad is perfectly safe for use when placed in the cover or under a blanket. As long as you can be sure that there is an insulating cover between the product and the Guinea Pig, there should be no chance of any burning. It is best if the whole lot are in a draft-free hutch so that some warmth can build up in there too.